While we haven’t received any official communication on the sunset of the Progression, we think the tea leaves are hinting of it. This new promotion is just one more hint. Others hints include the absence of new features and development coming from Exact. There is no software support; in fact, more and more support people are leaving the Progression world. 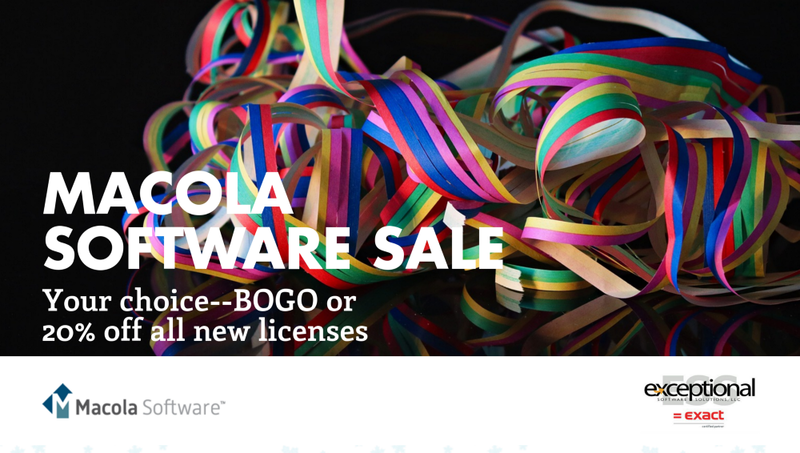 Rather than being “forced” into Macola 10 later, we recommend firms take full advantage of discounted pricing and the boatload of freebies included in this promotion-RIGHT NOW! Wondering about the system requirements to run Macola 10.5? Download the specs sheet. The promotion — which will expire December 31, 2017— gives you an opportunity to upgrade from Exact Progression to Macola 10 at serious savings* even your CFO can smile about. If you are running Exact Progression and upgrade now to Macola 10, we will increase your user licenses by 50% for no charge! For example, if you currently have 40 users of Exact Progression, we’ll give you an extra 20 user licenses as part of your upgrade. Macola 10 enables you to better understand and focus on your core business. By addressing your challenges, Macola 10 improves the way customers interact with your company. Macola 10 is the next evolution of Macola and is a huge leap forward toward a more natural ERP experience that increases the speed, accuracy, and reliability of operating your business. Plus, the Macola 10 upgrade promotion is full of fantastic freebies. Save now on training, support and community events. 5 Reasons to upgrade to Macola 10 — NOW! Macola 10 offers access to comprehensive features, a robust app store, support and productivity tools for everyone in your operation. With discounted pricing and fantastic freebies, this is a promotion you don’t want to miss. With the Exceptional Software Solutions LLC team we hold your hand through the experience. Our implementation experts guide you through the upgrade so that your information is easily accessible and working for YOU — before, during and after the upgrade. Exact Macola 10 means real-time data sync between your front and back office — giving you more accurate information when you need it. The better your company’s customer experience, the greater likelihood customers will continue to order from you, the more they order from you, and speak highly of working with you, the more referrals and increased order sizes. All which help your business grow. Exact Macola 10 is designed to increase the speed and flow of information, improving your experience and allowing you to execute tasks more efficiently. From cumbersome job quoting processes to visibility into resource utilization Macola 10. 5 can help. Watch the webinar recording to learn how. Exact Progression is a good solutions. The problem is it can keep your firm in “revision prison” — a world where your tech team is constantly fighting the battle of either falling behind or taking on those painful, disruptive, and costly ERP software upgrades. Macola 10 and it’s put a powerful, technologically advanced ERP system within reach. Q. Who qualifies for this promotion? This promotion is the “Progression to Macola 10” promotion and is only applicable for Progression customers migrating to Macola 10. These transition videos and access information will be made available in the beginning of November. Q. How does the 2 for 1 offer work? The 2 for 1 user offer is only valid for additional users — not for migrating users. Q. How is the 20% license discount calculated? The 20% discount is based on current customer pricing. Q. Does promotional price apply to enterprise maintenance or maintenance/reseller support? No. There is no discount on the Enterprise Maintenance or Maintenance/Reseller Support for either the 20% license discount or the 2 for 1 licensed users offer. These values are based on the retail value of all of the licensed users. Q. What’s the upgrade process really like? Our implementation experts guide you through the upgrade so that your information is easily accessible and working for YOU — before, during and after the upgrade. Get all the promotion details here! Terms, conditions and restrictions apply. Offer expires December 31, 2017. The 20% discount cannot be combined with 2 for 1 license special. Further, the 20% discount on license value excludes 3rd party licensing and Enterprise Support. Two for 1 license special is only good for newly added licenses. Enterprise support is calculated on the license user count. The Learning Pass is free for three months and requires a term of 15 months. Free months occur in last 3 months of the term. The Free Macola Evolve Pass for 2018 offer is good for 1 attendee only and is valid for attendance only. The free pass does not include hotel, travel and other transportation costs. This offer cannot be used in conjunction with or combined with any other Macola Software promotion. Any applicable maintenance fees will be charged based on retail prices and will be pro-rated to match existing prolongation date, if applicable. Not applicable to past purchases. These terms and conditions are subject to change at any time without notice.